In the drought of the late 1990s, people in the Solomon Islands and PNG turned to their traditional bush foods to supplement their diets. Now, the population of Central Choiseul, Solomon Islands, has traditional knowledge of its forest foods documented, thanks to an AusAID-funded research and publication project carried out by TerraCircle. As a culture in which traditional knowledge is transmitted orally through the generations, there is the danger of its being lost as people respond to changes in society by migrating and adopting new foods. Documenting traditional knowledge is a means of retaining it through social change. A practical bookThe book has been written to promote continued use of the rich knowledge of the forest and the land that has sustained people through time. TerraCircle hopes it may inspire others to revive and strengthen their traditional knowledge for today and for the future. The book was produced by the people of Lauru for the people of Lauru. Most of all, this book is written for the children in the hope that they, too, will eat from the forest and look after it so that the land can always provide for them. 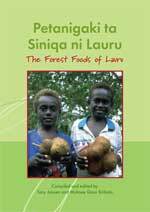 The Forest Foods of Lauru is written in the Babatana language of the people of Central Choiseul as well as English, the language used for the Solomon Islands education system. Lauru is the traditional name for Choiseul, a long, narrow, continental island that rises steeply from coast to the high ridge that forms the backbone of the landmass. The northern tip of the island with its small administrative centre and airstrip at Taro is not far from Bougainville, PNG. Production of The Forest Foods of Lauru was a protracted process entailing visits to the villages of Central Choiseul by TerraCircle’s Tony Jansen and botanist and native of Choiseul, Myknee Qusa Sirikolo. School children made leaf rubbings of leaves as a means of recording their shape for identification, while village women demonstrated food preparation and cooking so that a photographic record could be made. Tony, Myknee and people from TerraCircle partner organisation, the Kastom Gaden Association (Customary Gardening Association) accompanied foragers into the mountain forests to harvest the bush foods. Compiled and edited by Tony Jansen and Myknee Qusa Sirikolo. Book design by TerraCircle’s Fiona Campbell and editing by Russ Grayson. Published by Kastom Gaden Association, November 2010.